It's been a month since I have posted, not because there are no changes in the garden or because I am not working out there… but as I begin to describe particular crops, food or meals, I am aware that the much of it is a repeat of previous years' activities. Of course that is to be expected, but the actual doing of it, as with other activities is so much more educative than the theoretical contemplation of it. I am eating leafy green vegetables, tomatoes, potatoes and some eggplants (though these have not done as well this year.) This year has been a 'peak' year for earwigs and so quite a few plants suffered early in the season. As the weather has become hotter and drier, even the earwigs suffer and the vegetables are recovering. It's been a 'low number' year for ladybirds. There have been quite a few, but not the crowds that sometimes collect on parsley flowers in other years. I am not sure why. Birds have been busy with babies… and there's a cuckoo (Horsefield's bronze cuckoo) that I hear regularly. Parrots and Magpie larks have done well and honeyeaters of all sorts are abundant. So are the feral sparrows and black birds, though these do eat earwigs and soursob bulbs, so I tolerate them grudgingly. I hear the sounds of frogs most evenings… a Desert trilling frog, I think. I haven't heard the pobblebonk recently, but I have heard another higher piched trill…. at least two of those high pitched ones. I wish there were recordings af frogs online (as there are for birds) so that I could work out what these new ones are. The lack of glyphosate is finally making a difference to the reptile population. My whole yard is about an acre. I grow vegetables in less than ¼ of it. Someone who visited in my absence some time ago commented upon how much larger the garden looks in photographs. I'm not sure about that either. Much of the yard is fairly wild… unkempt… but that is why I have so many birds, bees, reptiles and other creatures. And they don't lead to a lessening of production, but I think that a healthier environment aids my vegetable-related endeavours. I look at the other creatures as allies, not competitors or enemies. Last year (2014) provided a total of 552mm (21.7 inches) of rain. This is actually a little above the average of about 480mm, though looking at the very dry garden, one would never guess that to be the case. That is because most of the rain fell in the first half of the year. By July, we had had more rain than the past couple of annual totals which have been below average. Since July, however, we have had very little rain. Apparently this is due to the el Nino effect that has caused the Pacific ocean to be the warmest that it has been since 1997 - 1998. For reasons that I don't fully understand, an 'el Nino' change causes a significant reduction in rainfall in this area. This year is proving to be hard to manage. The hot weather of the summer months changes my activities around the household. I still use the wood stove daily. This means cutting wood regularly and choosing any slightly cooler days to do it. Neighbours would not appreciate the chainsaw in the cooler part of the day at early morning or when the sun is low in the evening. The hottest part of the day is spent inside, where the temperature is mostly less than 30C… a row of hot days can cause indoor temperatures to rise though, reaching close to 40C eventually. I live simply so that there is not a lot that HAS to be done during the day. This is the season when people have a glut of some fruits. I occasionally benefit from this and preserve some for the winter, either as jam, cooked in syrup or frozen for later processing when it all gets away from me. Mornings are busy with daily tasks. My afternoons are spent reading or watching the cricket when there is a test match on. It is the life of luxury, in fact. Recently, I have been reading a biography of Emily Dickinson, the poet. She was all but unpublished until after her death in 1886. She was an interesting woman. She lived in a disfunctional household and in a community where suffering and death were all around her, common and a part of life. The 'conversions' to congregationalism of so many seem to have been the same kind of 'identity crisis' that people speak and write about even in modern times… though these days, it is not always a religious conversion of the same sort. Emily Dickinson appears to have found poetry rather than religion. This has made me wonder why difficulties and revelation of some sort are related. It seems that life is never 'fair'. The seemingly undeserved suffering needs somehow to be reconciled with the sense of justice that all humans have from an early age. Children are very conscious of what is 'fair' and what is not. Justifications for unequal suffering seem to require either an afterlife or some prior reason for the injustice, such karma from a prior existance. However the suffering is rationalised, the process gives a real sense of justice and peace of mind for the person involved. This biography of Emily Dickinson describes the difficulties of life at that time and how 'conversion' to trinitarianism or congregationalism was helpful to many in dealing with stressful events. And I am still reading about her schooling! She lived to the age of 56 so I have much to read and many poems to find. Meanwhile, I water the garden, collect enough vegetables and eggs for dinner and maintain enough order in the house to survive another day in health and happiness. It is almost time for the full moon and a new month of planning and planting. The moon will be full on Monday afternoon (Jan 5th) so I will be hoping for a clear sky as the moon rises on Monday evening at sunset. January 6th, the twelvth day of Christmas is almost here and time to pack away the decorations until next year. 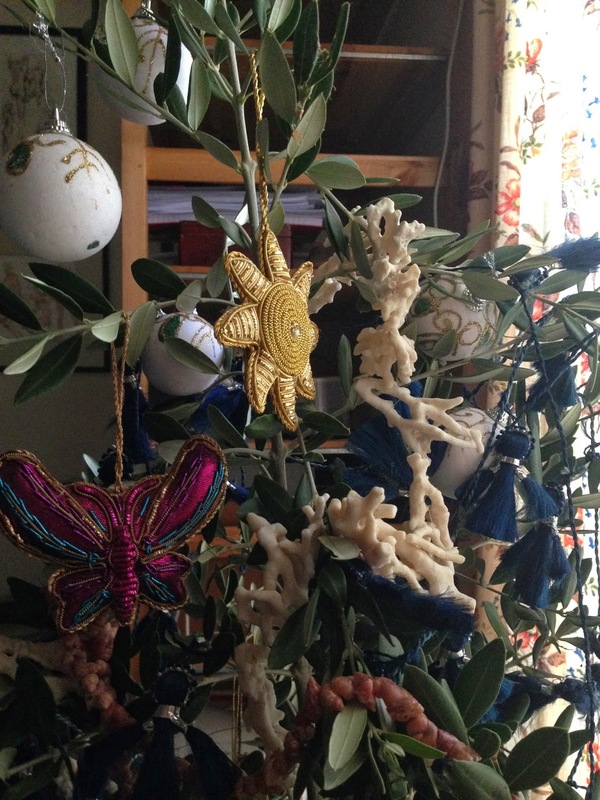 Olive branch with assorted decorations.